Coordination for these events is currently under way and a firm schedule of times will be available very soon. Please keep these dates in mind and consider participating, this is a great opportunity for everyone involved and should be very fun! Hello all, I hope everyone had a great week! Here is what's going on with the Squadron! Last Saturday, a dedicated group of Cadets and Senior members met at our new Base of Operations for a session of general cleaning and upkeep. We would like to recognize The following individuals for attending this event and take an opportunity to thank them for their contribution to our Squadron. When we received the go ahead to use our new location from the Central Illinois Regional Airport Authority, we were advised that the area had not been occupied in a while and that some cleaning would be needed. Rising to the challenge, the above listed individuals provided a few hours of labor which allowed us to clean up most of the dust, spider webs, windows, floors, walls, carpets and more. A big thank you goes out to Capt. Troyer who provided us with an industrial sized shop vac and ladder which gave us a healthy advantage for the job at hand. While there can always be more cleaning and polishing accomplished, our new facility is looking a lot better than before. What: Available Volunteers to help load furniture items at the donation point and then unload furniture items at our Base of Operations. if interested, please send 2Lt. LaRose an email at j.larose@mcleancountycap.org for more info! Cleaning supplies: Mop, Mop Bucket Brooms and Dust Pans. We do not want to interfere with the daily operation of our neighbors...CJ's Restaurant. In order to avoid this we ask that all squadron members and visitors utilize the North Western portion of our available parking lot. This will allow CJ's customers full access to the available parking spots closest to the restaurant....and give us all a little exercise! If you are unsure where our parking location is...ask! Ridgeview Color Guard presentation on August 24th at 1800hrs at Ridgeview High School in Colfax. Cadets that are tasked with this event have been notified and are set to go. This is a great way to gain some exposure for our Squadron. If anyone would like to attend this event to see our Color Guard members in action please contact either myself (t.brown@mcleancountycap.org) or C/2Lt. Lauzon (i.lauzon@mcleancountycap.org) for details! Labor Day Parade on Sept. 3rd at 0900 in Downtown Bloomington on the corner of Front and Center. Cadets are to wear their Blues uniform or if you don't have Blues...please wear black and whites (nice white button down shirt with black slacks and black dress shoes). Senior Members are also asked to wear their blues uniform or alternate uniform combination. We will be meeting on the corner of Front and Center and the parade will end at Miller Park. And Lastly...don't forget...we are quickly approaching the end of the year and that means our Squadron Banquet will be here soon...Keep that in mind! Through a generous agreement from the Central Illinois Regional Airport Authority and Board of Representatives, we have been allowed to use a portion of Airport Authority property to host our Civil Air Patrol meetings. The property is the old airport departure and arrival terminal which has since been replaced by a new and improved terminal which was built across the way. This new meeting place provides us a great opportunity to grow our squadron and provides us an excellent venue with heat, air conditioning and storage space. Please take a look at the slide show below to take a virtual tour of our new facility. Every summer, cadets gather at numerous activities all over the country. 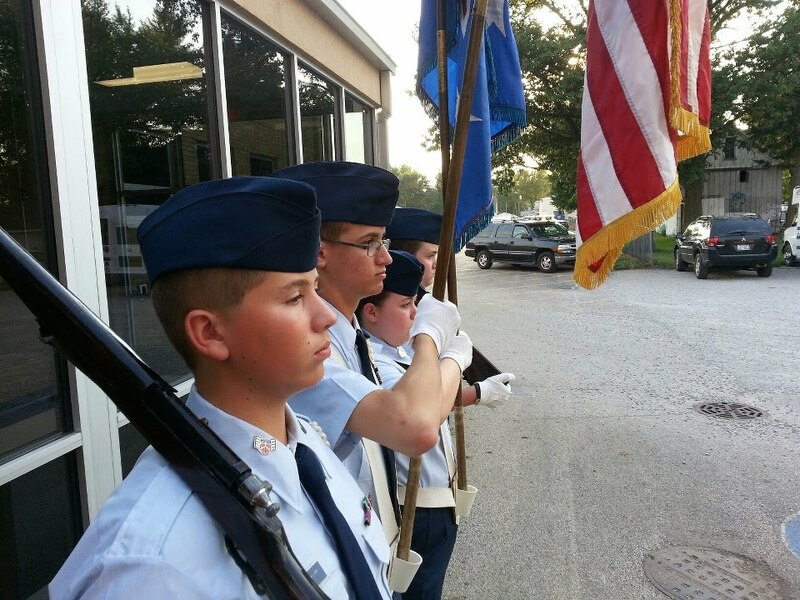 This year we had a number of cadets represent the McLean County Composite Squadron at different activities including Illinois Wing Spring and Summer Encampments, National Blue Beret and the National Emergency Services Academy. Below are some pictures from this years activities.